The weather is looking up these days and the sunshine and warmth are most welcome. It had been a while since my last visit to the Farmers Market and this time around I bought some Green Tomatoes or Tomatillos. I've used them before to make Salsa Verde for Enchiladas. 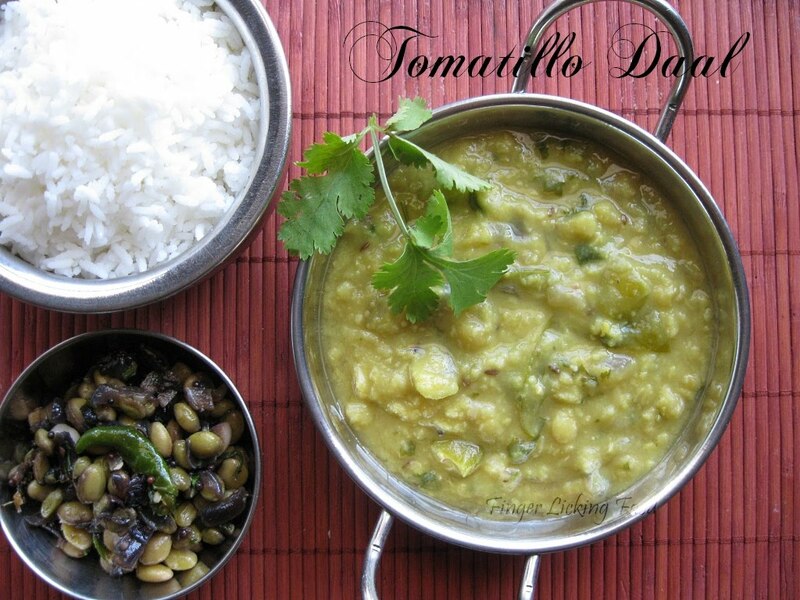 I usually make Daal with ripe tomatoes and I was out of them so used the Tomatillos. The tomatillos lend a natural tartness to the daal which is needless to say, flavorful. Pressure cook the Tuar and Moong daal together with the turmeric powder. Heat oil in a pan. Add the cumin seeds and sauté for a few seconds, then add the cut green chillies and asafetida. Add the chopped onions and cook on medium heat till the onions are done. Cut the tomatillos into bite size pieces and add them to the pan. Cook till the tomatillos are soft and well done. Now add the cooked daal and a cup of water. Season with salt and bring to a boil. Simmer for 5 minutes, turn off heat and garnish with chopped cilantro. Taste the daal and if you feel its too tart,add a small piece of jaggery when bringing the daal to a boil. This will cut back the tartness a bit and balance out the flavors. 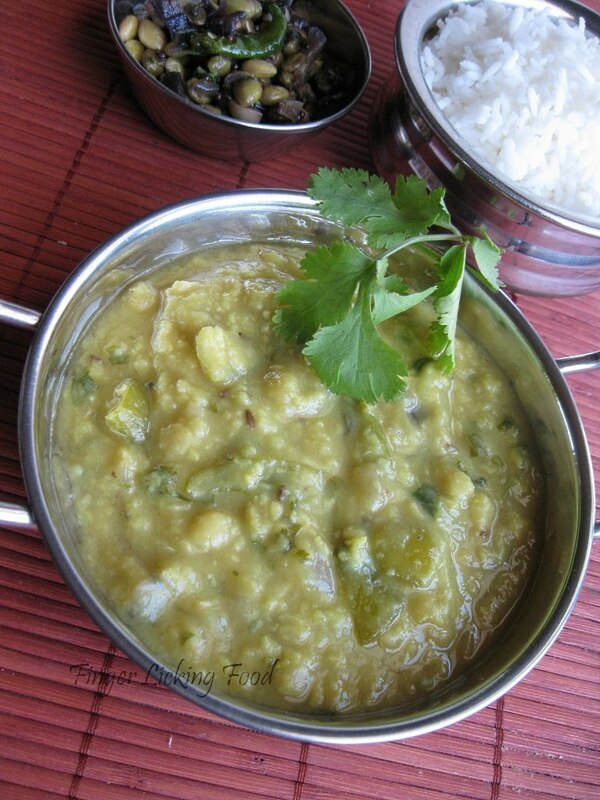 We had this daal with rice as well as chapathis and it tasted good with both. Nice combination of adding the dhal and green tomato.I usually add red tomatoes to my dhal but will surely try this.Sounds lovely. 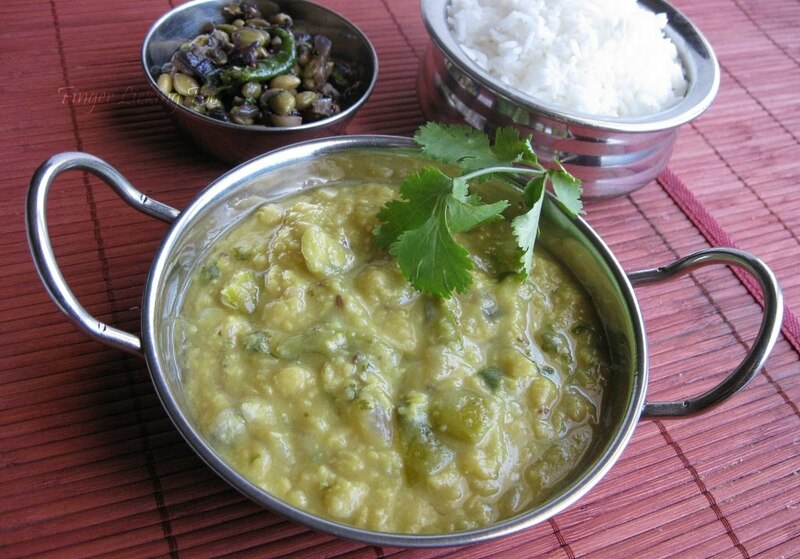 Thats a delicious dal...looks fabulous..
this dal is very new to me...looks so good. I make tomato dal with the ripe tomatoes and never thought of making it with the green tomatoes. Will definitely do so soon. Thanks for the inspiration. Looks yummy. Just one though...green tomatoes are not tomatillos. Tomatillos are sticky and have a thin outer covering and are used in salsa verde as you have mentioned already. Green tomatoes are not sticky and they don't have an outer covering. rkramadh, in the US green tomatoes are not available like they are in India. Here we get only Tomatillos, which is what I have used in the recipe. I mentioned green tomatoes for the benefit of my readers in India. Hey accidentally i stumbled on your blog. Great blog! It tastes very good. I cook almost the same way.only change is i don't add onions as i feel onion flavor dominates this.